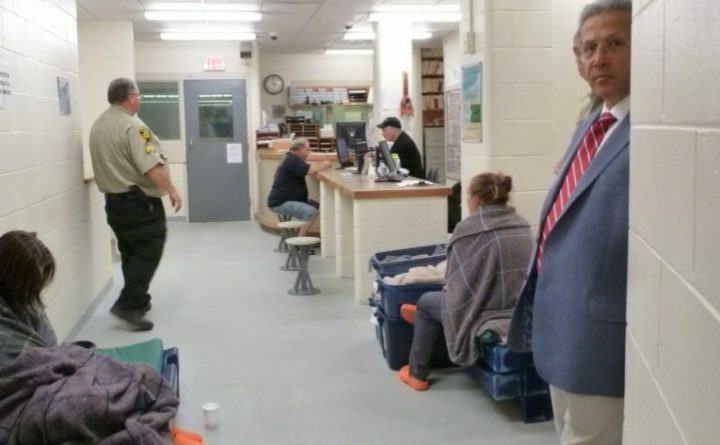 Penobscot County Commissioner Peter Baldacci (right) tours the intake area and holding cells at the Penobscot County Jail. Sheriff Troy Morton has advocated moving intake and holding cells to the former YMCA. Penobscot County voters won’t be asked to fund an expansion of the county jail until 2019, delaying a vote that was anticipated for the November 2018 ballot, according to County Commissioner Peter Baldacci. A recently formed building committee needs more time to recommend whether the county should renovate or tear down parts — or all — of the condemned, 50,000-square-foot YMCA building at 127 Hammond St. where the expansion is slated to occur. Commissioners decided Tuesday to hire an engineer to consult on the plan. The committee should have a proposal ready in the fall, setting the stage for a bond referendum question on the following June ballot, he said. Overcrowding has long plagued the current 61,800 square foot Penobscot County Jail, which is licensed to house 157 inmates but on average exceeds that capacity by about 60 people, according to Sheriff Troy Morton. The issue has burdened staff, exposed the county to liability and run up the costs of operating the facility, which pays between $60 and $100 to board overflow inmates elsewhere, commissioners said.